The Radisson in Noida pops out of nowhere, between the busy streets of this burgeoning city. It does face the famous Mall of India, a prominent location but I stumbled upon it from one of the side entrances. The restaurant décor and design seem to be inspired by baroque architecture. It is a regal spread with gilded candle and lamp stands and pastel columns and curtains. The chairs are also throne like. We sat in a pleasant corner, as I usually do in restaurants, to eat without any disturbance and to people-watch from a distance. The buffet looked inviting but we went for the lazy option, a la carte. 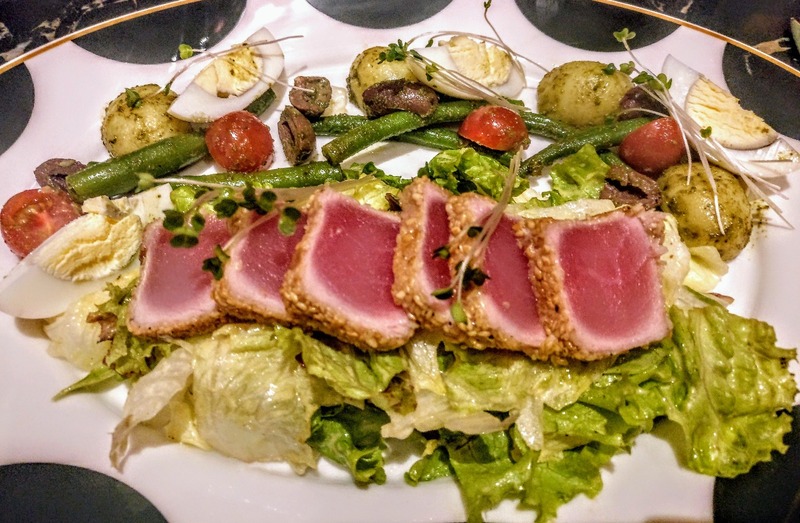 First up was the Tuna Nicoise, a dish I had been meaning to try for a while. It is a salad hero-ing tuna, cooked rare along with potatoes, hard boiled eggs, cherry tomatoes and beans. It was a refreshing preparation and the tuna blushed pink just how I had seen it on TV. The menu reflects royalty as well. It has a badge of the restaurant on the first page – SXVIII, which if you haven’t guessed already is S-18 (since it is located in Sector 18, Noida. I took a while to get that reference and the roman numerals. Maths has never been my forte). The badge features a scarlet crown over the letter ‘S’. The commitment to the theme is laudable. After great deliberation, we decided on comfortable classics – pasta and pizza. We ordered the Penne Pomodoro Con Pollo (pasta with chicken in a tomato sauce), a recommendation by our waiter and their Parma pizza. Parma ham is a thin slice of ham dry-cured in salt to make the meat supple so it was definitely on the salty side. It was loaded with meat and garnished with ricotta and truffle oil. We ended our meal with an array of little desserts to maximize our sweet consumption including Orange Chiboust, Banana Crumble and Cream Caramel. The restaurant was brimming with people even at 11 in the evening and waiters were zooming past. The newly renovated SXVIII seems to be attracting young and old alike in large numbers, offering them a grand fine dining experience to indulge on.